Buy 5+ for $15.26 each. Buy 50+ for $0.23 each. The MISPRO Ultrachrome Equivalent Inks Have The Widest Color Gamut, Excellent Light Fastness, Vivid - Stable Colors, And Intense Saturation. They Are Scientifically Formulated And Extensively Tested For Longevity, Durability And Water-resistance. MISPRO Inks Are Perfect For Posters, Banners, Murals, Indoor And Outdoor Displays, Art Prints And Photographs. 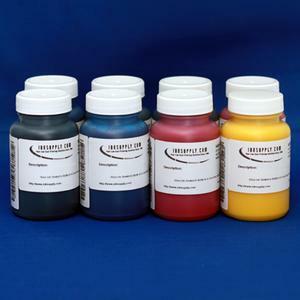 Our MISPRO Inks Are Intended For Professional Use By Photographers And Artists. They Can Aid Professionals In Producing High-end Graphics, Advertising, Archival And Fine Art Prints With Epson Printers. This Ink Set Is The Enhanced InkSupply.com Version Of The Epson UltraChrome Ink, Using The Latest Pigment Technologies. Therefore, These Inks Are Designed To Work On Matte Finish Paper, Semi-gloss, Or Glossy Papers. Our Formulation Is Not As Shinny On Glossy Papers As The Epson Inks, Making Your Prints More Realistic Looking. Due To These Qualities, MISPRO Ink Is The Ideal Replacement For Any Of The Epson Printers Using DuraBright?, DuraBright Ultra, Or UltraChrome Epson Inks. The Inks Are Available In The Correct Sets For Easy Replacement: 8 Color, 3 Black (matte, Photo, Light) And 5 Color (C M Y Lc Lm) Or 4 Color Inksets (C M Y K). As With All InkSupply.com Inks, MISPRO Is Proudly Manufactured In The US To The Highest Quality Specifications Available. Higher Ink Limits Can Be Achieved, Resulting In Increased Gamut On Most Coated Media. Elimination Of Gloss-differential (colors And Blacks Have The Same Reflectivity). Fully Compatible With UltraChrome Printers, Flushing Not Required. Improved Dot Gain, Color Density, And Gamut Over Epson Inks. Superior Flow-through On Continuous-feed Systems. Greater Resistance To Water And Better Durability. Higher Gloss And Reflectivity, Less Bronzing.